Frank, no ordinary sixteen-year-old, lives with his father outsIde a remote Scottish village. Their life is, to say the least, unconventional. Frank's mother abandoned them years ago: his elder brother Eric is confined to a psychiatric hospital; and his father measures out his eccentricities on an imperial scale. Frank has turned to strange acts of violence to vent his frustrations. In the bizarre daily rituals there is some solace. But when news comes of Eric's escape from the hospital Frank has to prepare the ground for his brother's inevitable return - an event that explodes the mysteries of the past and changes Frank utterly. I must admit, I absolutely love a good, successful Scottish writer. 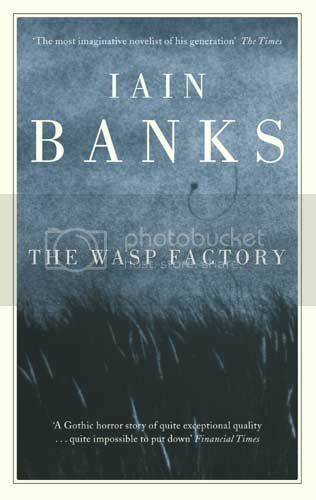 I must also admit that I have never been a particularly huge fan of Iain Banks - in fact, I have attempted this book probably three times, and this is the first time I have managed to finish it. It wasn't that I disliked it on my previous tries; I found it suitably strange and interesting enough. I would just always end up abandoning it for something else. Maybe it's a question of maturity; I loved it this time. The story is told by our protagonist, Frank Cauldhame, who is a sixteen year old sociopath. He is very clever, very resourceful, very imaginative, and also incredibly disturbed. He tells us the story of his life in little snippets surrounded by tales of the present. The story of his life is an unsettling one; he tells us of the three young children he murdered when he himself was a young child, then tells us "it was just a phase I was going through"; he tells us of his brother's upsetting experience which drove him insane, and led him to burning dogs and forcing children to eat worms and maggots; he describes his shamanistic lifestyle, his horrific rituals and ceremonies, and his worrying belief in the reliability of these. At the beginning of the novel, Banks sets the scene perfectly for a gothic horror. Father and son living alone on an isolated island, poles scattered around sacrificing the decaying heads of animals, and the notion that murders have taken place on the island courtesy of Frank himself. Perfect. Frank is sadistic, cruel, and affectless, but he can be very self-deprecating, sardonic, and educated in a strangely loveable way. He comes across at times as a very sensitive child who struggles to connect with others his own age and who is very much an outsider. The island he lives on seems very symbolic of this, shutting Frank off from the mainland quite considerably. Each of us, in our own personal Factory, may believe we have stumbled down one corridor, and that our fate is sealed and certain (dream or nightmare, humdrum or bizarre, good or bad), but a word, a glance, a slip - anything can change that, alter it entirely, and our marble hall becomes a gutter, or our rat-maze a golden path. The Factory really is a wonderful tool for Banks to make his readers think. We read of Frank torturing the wasps as a mechanism of knowledge to tell him what to do next, or to advise him that something good or bad is on its way. We, as readers, find this torture of wasps entirely wicked. But how many of us have swatted, killed, maimed or poisoned a wasp, or any another insect? In this case, can we judge? Banks really drives us here to question our own morals and, admittedly, self-delusions. It is difficult to stomach in places, and I certainly wouldn't recommend it for those with a weak disposition. Frank describes in detail his torture and killings of small animals and children. It is sick, twisted, and reprehensible, but entirely delicious at the same time. It's definitely not for everyone, but I would absolutely recommend you pick this up and give it a try. I am going to read some more Banks in the near future.